The beautiful, tropical Cayman Islands—a place where time seems to move a bit slower, gentle breezes soothe the soul, and turquoise warm waters lap the shoreline. It’s also where you’ll find stone masons who still use their hands to cut rock for building projects. And such is the case with a custom, green LEED Gold registered spec home called Bella Verde that is nearing completion in Grand Cayman, one of three idyllic islands that make up the British Territory. While cutting stone by hand is surely an aspect of green building due to the absence of machinery, hand cutting is also a product of necessity. Stace McGee, Principal of Environmental Dynamics, Incorporated (edi), a green design architectural firm in Albuquerque, NM, with a satellite office in Grand Cayman, says electricity and water are quite expensive in the Cayman Islands, which is why there are no large plants for manufacturing project-ready stone. How expensive? It’s about 45 cents a kilowatt hour for electric; it’s an average of 13.6 cents in America, according to the U.S. Department of Labor. What happens is stone is harvested by the island’s quarries utilizing heavy machinery, and then purchased retail by the stone masons. 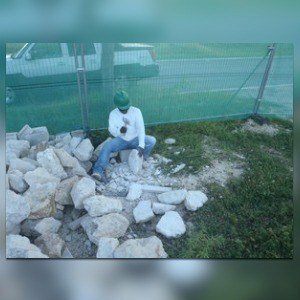 All the cutting and installation of the stone is then carried out manually. “Using local stone also means there is less embodied energy from shipping the stone in from off island,” says Stace. He says they use a local coral stone for all of edi’s island projects. Coral stone? According to Jason Brown, Quantitative Surveyor for Island Construction, the local frame contractor for Bella Verde, the stone for this particular LEED project is a mix of limestone and coral-based rock. It makes for one hard, durable rock, because this variation of limestone is not soft, like a calcite. Jason explains that this type of stone occurs naturally in the Cayman Islands due to the islands’ surrounding coral reefs with outcroppings of what is known as cliff rock. The reefs are not directly used to harvest the stone; however, the stone occurs naturally in the islands’ substrata. “We like the local coral stone because it creates a durable base and ties the walls and site together,” says Stace. A durable base indeed. This coral stone acts like a barrier when the hurricanes, tropical storms and heavy rain bear down on the island. Its properties deal with moisture by bleeding it back out away from the building. Talk about meant to be. Back to the stone cutters. For this particular project located in West Bay, Georgetown, two stone cutters cut stone for 280 man hours between them to create three layers of two-foot tall coral stone around the base of the house. While the majority of the stone was chipped by hand, some were saw cut and then chipped. Boulders are delivered by trucks and dropped at the site for the stone cutters, who work outside in temperatures ranging from 85 to 95 degrees. They are true artisans, creating each piece to fit and generate tight joints. The walls for this home are ICF (insulated concrete form) clad in James Hardie cement board, stucco and stone siding. Almost no wood was used in the construction of this house, which is supported with concrete grade beams and piers. Even places where you would think wood would be used, like window frames, it’s not. The home, which is slated for completion this summer, took about a year to build—literally one stone at a time.